Comm Eye Health Vol. 31 No. 103 2018 pp 63. Published online 09 November 2018. Consultant Ophthalmologist: Tennent Institute of Ophthalmology, Gartnavel Hospital, Glasgow, Scotland, UK. The retina is the light-sensitive part of the eye. The outer layer of the retina is composed of photoreceptor cells, which generate a nerve signal in response to light. Normally, this photoreceptor layer is in close contact with the choroid and retinal pigment epithelium. The photoreceptor cells depend on this contact for their metabolism. If they are separated from the choroid by a retinal detachment, they may be irreversibly damaged. This is why retinal detachment is an ophthalmic emergency. As the eye ages, the vitreous becomes liquid, and eventually collapses. When this happens, it may pull on the retina, causing a retinal tear. Fluid then passes through the retinal tear and into the potential space between the retina and choroid. This causes a retinal detachment, which may progress rapidly. Myopia (more common in longer-sighted eyes). The initial symptoms of retinal detachment include a sudden increase in floaters, sometimes with flashes of light in the peripheral vision. As the detachment progresses, there may be a corresponding visual field defect. When the macula detaches, there will be a sudden and severe loss of vision, usually to less than 6/60. 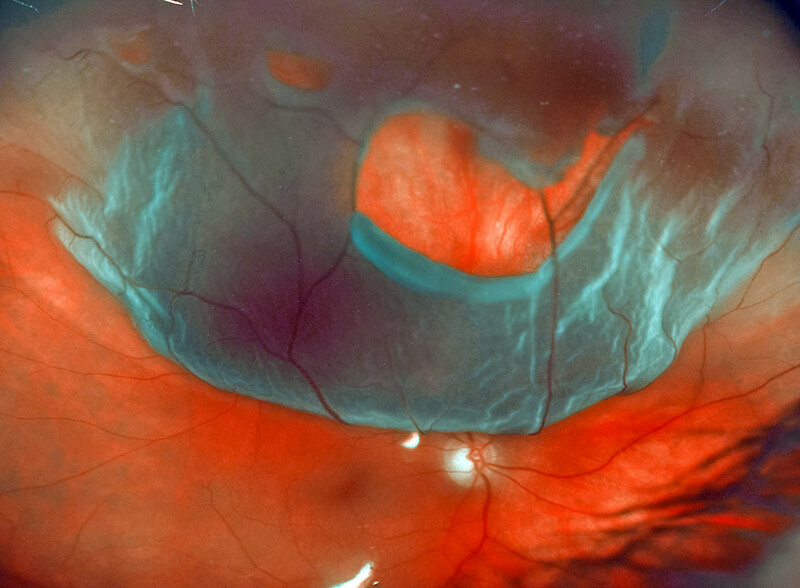 When examining the eye using a slit lamp, you may see pigment cells in the vitreous. To recognise a retinal detachment, you need to examine the retina. Ensure that you have enough training and practice to develop this skill. Check that the ophthalmoscope works, and that spare bulbs and batteries are available. Retinal detachment is treated using surgery. The aim of surgery is to close the retinal break. This stops fluid from leaking under the retina and allows it to re-attach. This can be done either by removing the vitreous (using vitrectomy) and filling the eye with a bubble of gas that holds the retina in place, or by stitching a piece of plastic to the sclera (a scleral buckle). This pushes the outer layers of the eye against the break and plugs it. Approximately 85% of retinal detachments can be cured with a single operation. However, the eye will only regain good vision if the operation is carried out soon after the retina detaches. Not all clinics provide retinal surgery, so find out where your nearest retinal detachment surgeon is based. You should be able to explain to the patient how much the treatment will cost, and how to get to the clinic. You should know the contact details of the surgeons so that you can phone to tell them the patient is coming. If you recognise retinal detachment early, and refer immediately, you will save the patient’s sight.